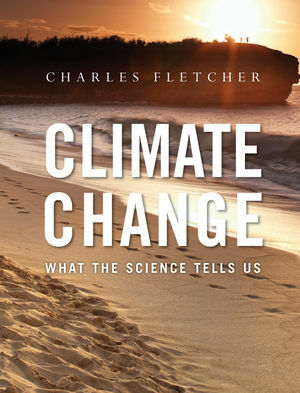 Fletcher's 1st edition of "Climate Change: What the Science Tells Us" places strong emphasis on the peer-reviewed literature in reporting the impacts of climate change on the ocean, terrestrial ecosystems, the water cycle, human communities, dangerous weather patterns, and potential future Earth systems. The text offers detailed discussion of greenhouse gases, oceanic and atmospheric processes, Pleistocene and Holocene paleoclimate, the human fingerprints of climate change, modeling climate, sea level rise, climate impacts on economic sectors, and dangerous weather patterns associated with climate change. Fletcher offers the first real textbook to present the science surrounding climate change at the right level for an undergraduate student. His polished writing style makes this an entertaining read while the pedagogical support and organization helps students better identify and understand key concepts, ideas and terms. Each chapter is organized with learning objectives, student exercises, videos, scientific citations to promote further learning, and creative thinking problems to underpin classroom discussion. Charles Fletcher is the author of Climate Change: What the Science Tells Us, published by Wiley. A current update on climate change with the effects on the environment. Written for an introductory audience. Accompanying videos, simulations and instructional support. Fletcher’s polished writing style makes this an entertaining read while the pedagogical support and organization helps students better understand key concepts, ideas and terms.